Wes Moore was born in a tough neighborhood in Baltimore and eventually ended up in military school where he went on to become a very successful Rhodes Scholar. Meanwhile, another Wes Moore, born in the same neighborhood mere months apart from Wes ended up in jail for life for murder. These two Wes Moore’s do not meet until adulthood when their lives and futures are already set, but when the author of this book learned of the other Wes Moore’s existence he felt compelled to visit him in prison and get to know him better. 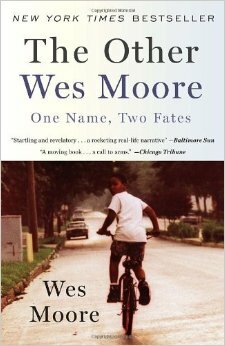 He writes this book to ask what factors sent one Wes Moore down one path and the other Wes Moore down another. Family support? Opportunities? Personal choices? This story follows both Wes Moore’s lives as they make decisions to ultimately change their paths in two very different directions despite many similarities in the circumstances they were born into. Both Wes’s grew up without a father, but for very different reasons. Both Wes’s had chances to escape the life of crime and drugs their surroundings provided. Both had hard working mothers who tried their best to raise them alone. How then did one end up a war hero while the other ended up in jail for life? This book asks difficult questions at a time when too many headlines focus on terrible things that have happened to kids from tough neighborhoods and home lives. The story can get a bit confusing at times as many characters are introduced quickly, but the plot is interesting and many students will enjoy the honesty present in the text and subject matter.